If you’ve passed through the South Manchester village of Timperley in the past year or so, you’ll have noticed a new landmark by the main crossroads. Well, actually, it’s now the only landmark since Rook’s the ironmongers turned into an all-night chemists. Anyway, a full-size bronze statue of Frank Sidebottom is in place to greet all visitors come rain or shine. In fact, if you’ve spotted him in the last few weeks, you’ll know he’s currently resplendent in a Santa suit. 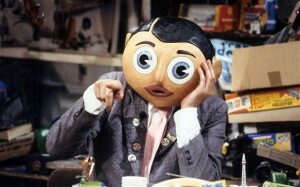 It’s getting less and less likely that anyone will be unaware of Frank Sidebottom. It’s been a big year for him and his big shorts. Aside from the statue appearing, Jon Ronson’s film Frank was kind-of-sort-of inspired by him, and Ronson wrote an accompanying book to explain the background. An ambitious crowd-funded documentary about Sidebottom is currently at the editing stage. 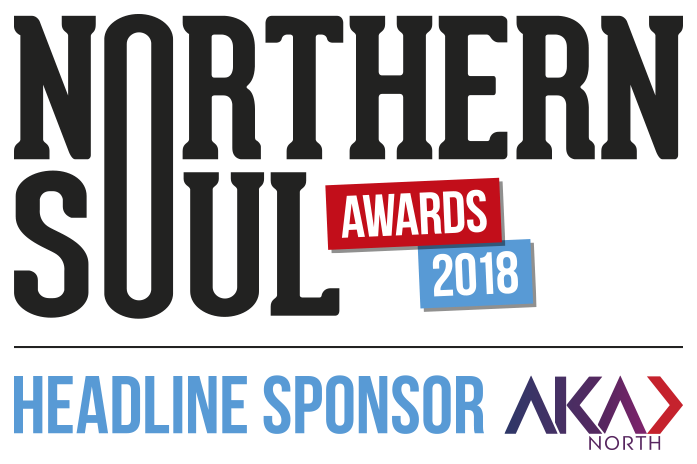 To top it all off, the full story has been told, in fittingly unorthodox fashion, in a compelling new biography by Manchester music journalist Mick Middles, whose previous books have documented such remarkable local music stories as Elbow, The Fall, The Stone Roses and Factory Records. 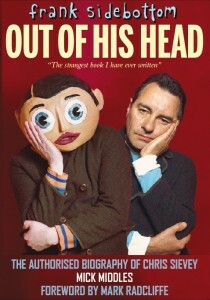 It’s worth making the point, though, that Middles’ Out of His Head isn’t the biography of Frank Sidebottom. Just between ourselves, Frank Sidebottom was a fictional character. Instead, it’s the biography of the late, lamented Chris Sievey, creator of Sidebottom and the man behind the mask (with a nose peg on). There was much more to Sievey than Frank though, and that’s really the driving theme in Middles’ book. Well before the character of Frank emerged, Sievey was an established and highly creative songwriter, whose post-punk band, The Freshies, were perpetually on the verge of big things – but sadly, that’s where they stayed. While Middles’ book isn’t structured chronologically, it’s quite some time before Frank makes an appearance. Although it redresses the balance in terms of Sievey’s whole life and career, Middles’ book inevitably goes to some lengths to unpick the extraordinary phenomenon of Frank Sidebottom. At first, Sievey created him as as The Freshies’ fictitious number one fan, but he quite literally developed a life of his own, with a raft of records, live tours and TV shows. 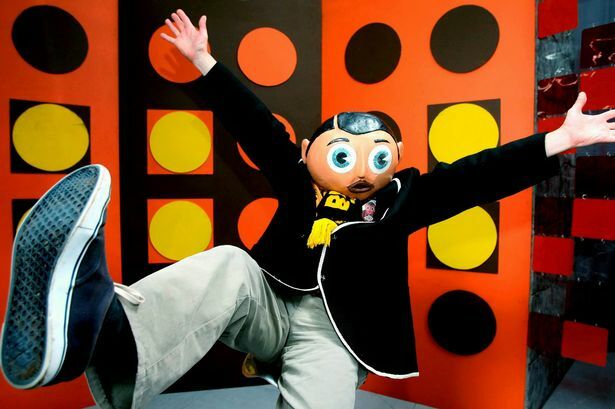 On the face of it, Sidebottom was simply a comedy character, a living, breathing cartoon. But Middles’ book digs a lot deeper, and looks at some of the implications of Sievey bringing the character to life. For many years, the exact identity of the man behind Sidebottom was only known within certain circles. 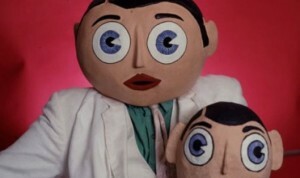 Sievey had a habit of responding only to the name ‘Frank’ once he’d donned the head. Without it, he’d talk about Frank in the third person, often quite negatively. And then there’s the matter of his tiny accomplice, Little Frank. There aren’t many people in the history of entertainment who’ve had an entire career performing with their face covered; fewer still who did so with a further puppet alter-ego to bicker with. It might have been very funny, but it can’t always have been ideal for Sievey’s peace of mind. In an endearingly eccentric, round-the-houses manner, Middles’ biography follows Sievey from his youth as a wannabe musician through his time in The Freshies, to his manifold, often highly inventive creative endeavours, and the rise and fall of Frank Sidebottom. For a time, Sievey retired the character, and embarked on a tentative new career working on children’s shows such as Bob the Builder and Pingu, both made locally in Broadheath by Hot Animation. By the time of his death, though, he’d made his peace with Sidebottom and revived the character. 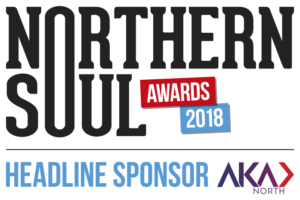 As part of his research, Middles tracked down several of the future big names who worked with Sievey, including Jon Ronson, Mark Radcliffe and Marc Riley. There were even more, though: Chris Evans was a young dogsbody at Piccadilly Records when he became the driver for the Sidebottom tour van; Caroline Ahearne was a friend of a friend who took on the character of Sidebottom’s neighbour Mrs Merton and developed her into an entirely independent comic creation. Sievey died in June 2010, aged just 54. While it’s heartbreaking that he didn’t live to see the current wave of love for and fascination with his most famous creation, it’s still remarkable and delightful that it’s happened at all.